Since he lives in Coquitlam, we decided to meet halfway in Port Moody. Originally, we were planning to eat at Osamu; but it is closed on Sundays. As a n alternative, we chose Kurumba. 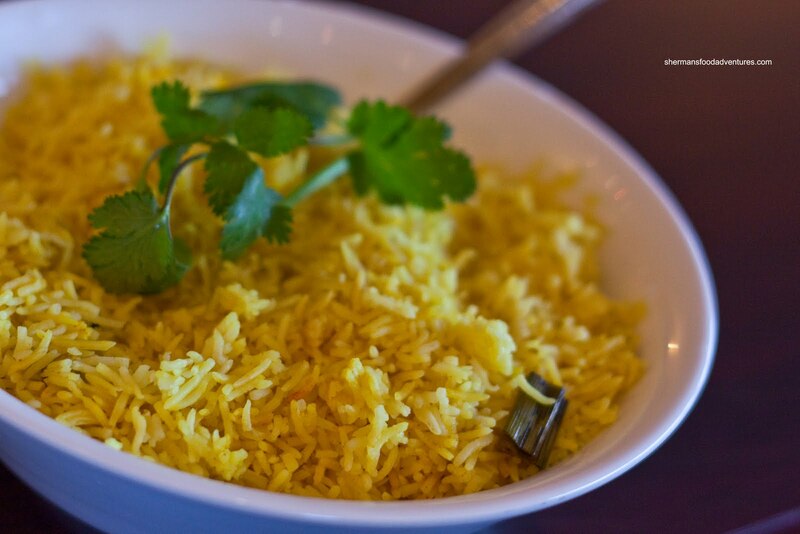 Similar to Banana Leaf and Tropika; but not really, Kurumba serves up specialties from South Asia, particularly Malaysia, Sri Lanka, Singapore and Thai. They also have a page on the menu dedicated to Chinese food. We figured that is merely there to satisfy the general population; rather than be representative of their cuisine. We decided to start with their Kurumba Platter which consisted of Roti Canai, Hot Garlic Wings, BBQ Pork, Calamari and Veggie Spring Rolls. 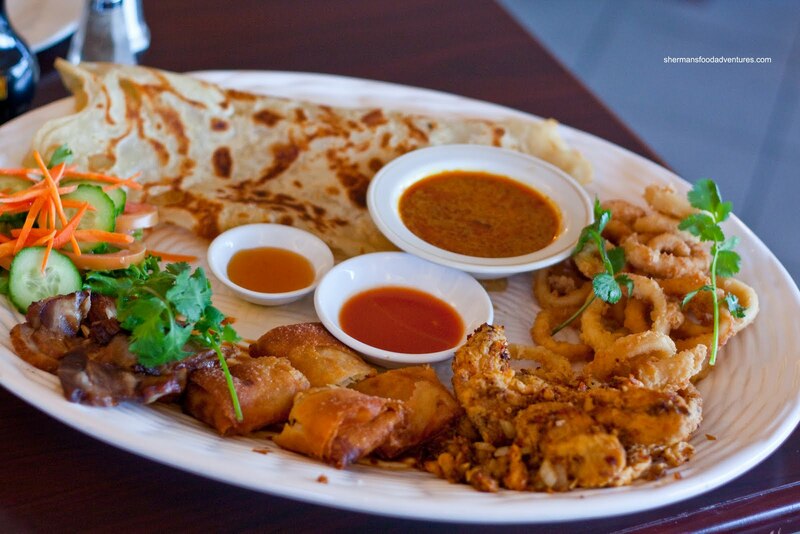 The best part of this platter was the curry dip for the Roti Canai. 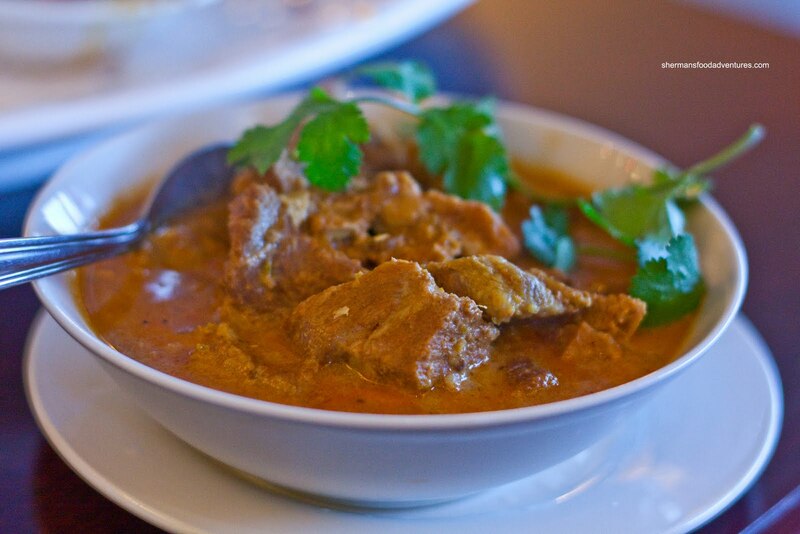 Normally, it is sweet and exhibits only a hint of heat at Banana Leaf and Tropika. Not here. It was spicy and had a lingering aftertaste. The roti itself was crispy on the outside and somewhat doughy on the inside. In regards to the aforementioned restaurants, I do not blame them for "watering" down their food since most of the diners out here would not be able to handle the heat. We were a little less enthused about the Chicken Wings, the batter was too thick and crusty. However, the wok tossed ingredients that flavoured the chicken wings were pretty good - once again with heat. The Calamari was tender and the batter was light while the Spring Rolls were pretty much you r typical spring roll. The BBQ Pork was on the slightly chewier side; but that was not too bad. Once again, we did the order-too-much-food thing. We went for smaller sizes of their curries; yet they still turned out to be quite large. The Beef Rendang was pretty much a large bowl of meat. We thought the meat was moist and surprisingly not dry. The flavours were subtle with only a hint of heat. We realize that this is not supposed to be a spicy nor wildly flavourful dish; but it was bordering on bland. We liked the Yellow Basmathi Rice, it was very aromatic and dry (which is good for absorbing sauce). 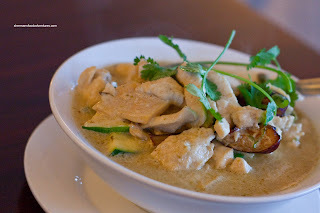 Next was the Chicken Green Curry. This particular version was coconutty without being too thick. There was a strong underlying heat to this and we absolutely loved it. Big pieces of white meat mixed with fresh veggies completed this well-executed curry. Let's see, we had beef and chicken; so naturally a Pork Curry was in order. The pork was absolutely melt-in-your-mouth soft while the sauce was mild and somewhat sweet. A nice change from the spicier green curry. To fulfill our vegetable quota, we ordered the Sambal Green Beans. The beans were slightly soft from the flash frying, while the sauce was quite spicy. This was definitely not your typical Banana Leaf/Tropika version, which usually tastes much more sweet than anything else. Overall, the meal was quite good. We weren't wow'd per se; but we did appreciate the level of heat in most of the items. It might be a bit too strong for more conservative diners though. We also found that the prices were quite reasonable for the portion size. 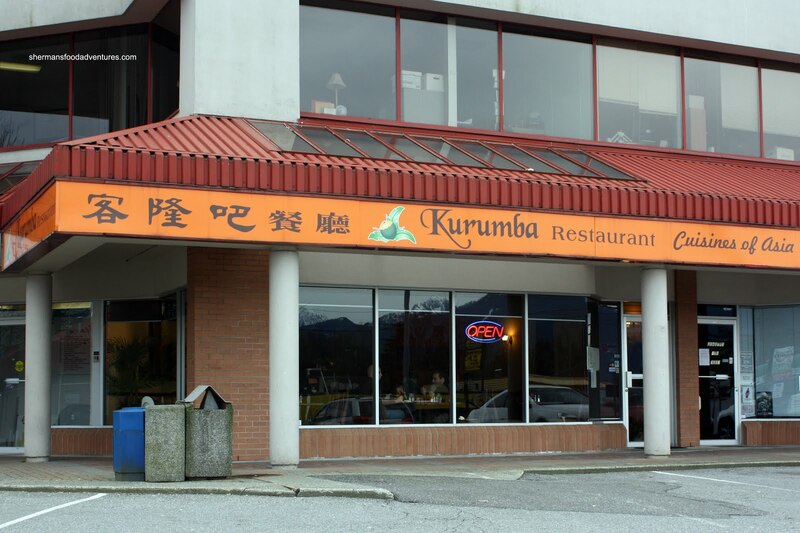 No wonder the Vancouver Sun puts Kurumba down as one of their featured restaurants for 25 meals under $25.00. Kurumba is my favorite go-to place for hometown taste!! Back then in Singapore more than 4 yrs ago, Roti Canai (aka Roti Prata over there) with Indian curries was a Sunday ritual for my family. We really miss it over here. Imagine our glee when we discovered Kurumba! The Roti at Kurumba is about twice the size of those found in Singapore/Malaysia as well as those frozen ones found at T&T. The lunch special is especially good price-portion-wise, as you get one giant Roti with a good-sized bowl of curry for ~$7.00. Definitely satisfying for one person. I have no issue with the texture of the Roti--slightly crispy on the outside and doughy on the inside--very authentic as far as memory goes. 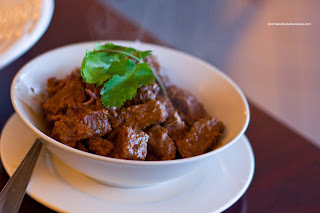 (You can ask for less of the oil on top of the curry, which can reduce a little of the spiciness at the same time.) For an extra $0.50 you get an egg incorporated in the Roti--which is a common Singapore/Malaysia practice. I especially like the curry chicken, which is very well done with the chicken tender and succulent--not dry and overcooked as in some other places. 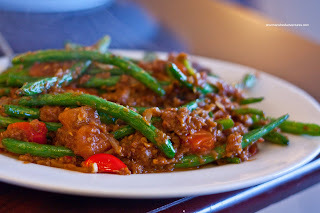 Another Kurumba favorite of ours (as well as several of our S.E.Asian friends) is the horfun (stir-fried flat rice noodles in egg-swirl gravy, with seafood or other meat). @Yanny's Table Yay! I'm glad you like it too. I really, really appreciated the bold flavours. I'm so disappointed with the sweet, watered-down stuff everywhere else. Can't blame them though, not everyone wants bold. Thanks for the recommendation, Sherman! We were in Port Moody to eat at Rehanah's, which was understandably closed on Sunday. Luckily, Kurumba is right down the street. I loved the roti canai enough to get a second order. With the sambal prawns, it was perfect. It seems that the chef at Kurumba has picked a great variety of dishes without being constrained to a single 'ethnic' cuisine. 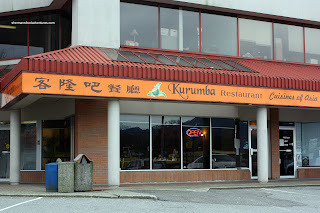 Next time I'm in Port Moody, I'll be back to try some more. Keep on blazing a trail for hungry Vancouver! @Samm Cooper NP! I'm glad you liked it! Such a hidden gem eh?